There are two types of companies - those that have an employee handbook and those that don't. Many smaller companies and start-ups fall into the second category, although those companies can be vulnerable without a handbook. In the employment law context, small companies and start-ups are facing a growing number of lawsuits for harassment, discrimination, retaliation, and wage and hour violations. Over 40% of lawsuits against corporations for such employment disputes are filed against small companies with 15-100 employees, and employment related lawsuits are the fastest growing civil cases in the United States. New or smaller companies may not have the resources to devote to following complicated California employment laws. They probably don't have an HR department, and they may not even have an employee trained in HR. The company culture may be very informal, which can contribute to employer liability. For example, employees may incorrectly think that a laid-back office culture means that they can make inappropriate sexual or racial jokes. An employee handbook reduces the likelihood of harassment or discrimination. Although a handbook alone cannot prevent employees from harassing or discriminating against coworkers, it certainly can be a forceful reminder to employees that such behavior will not be tolerated. It demonstrates that the company cares enough to go on record about what it considers harassment and what will happen if employees engage in harassment or discrimination. In addition, it sets up a measurement against which conduct can be judged. Moreover, many companies may not realize that California law requires them to either distribute a brochure from the DFEH or develop and implement a sexual harassment prevention policy with a procedure for employees to make complaints and for the employer to investigate the complaints. As most employers here know, California is an "at-will" state, which means that an employee can be dismissed for any legal reason. The at-will status of an employee can be changed, however, by an oral promise or ongoing conduct that suggests that the employer is promising continued employment. A well-drafted employee handbook will help ensure that enforceable employment contracts that change the at-will status are not created, and essentially create a termination for "cause" by showing that an employee violated employer policies when she acted in contravention of the handbook. One other benefit of an employee handbook is that it clearly and (hopefully) unambiguously informs employees about various company policies. Many smaller companies or start-ups may not have a human resources specialist on staff. 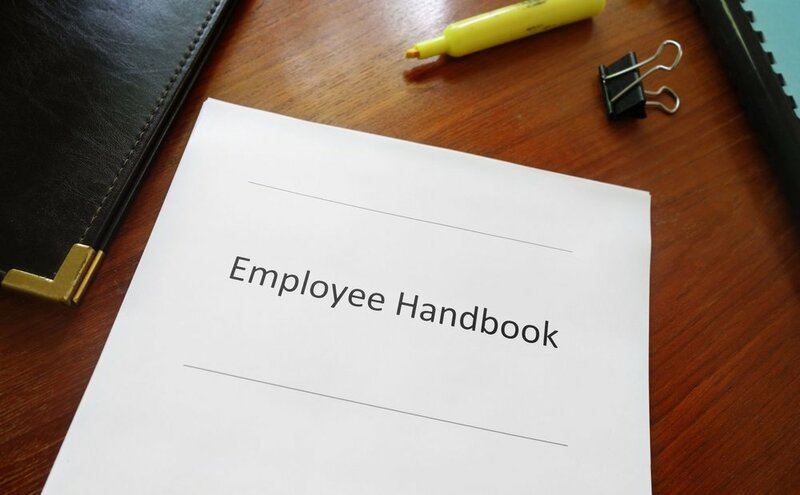 The employee handbook can be especially helpful in these situations because it can serve as a resource for information about pay, benefits, and other terms of employment. There are many templates online for employee handbooks, but even the templates require knowledge of employment law. For example, California's relatively new paid sick leave laws can be quite complex, and a one-size-fits-all approach might not work in this context. If you operate in San Francisco, your company may also have to follow the San Francisco Paid Sick Leave Ordinance. You should have your employees initial or sign the areas that include these important policies. One hybrid employee handbook development approach that we recommend is downloading a customizable handbook and then hiring an attorney to review it. You should also be careful not to inadvertently add something to the employee handbook that will cause problems down the line. Many employers in California still refer to a "probationary period" in their employee handbooks, but this could create an expectation that the employee's status will change after the probationary period ends. Because California is an at-will state, a probationary period is completely unnecessary and, in most cases, should not be included in an employee handbook. After the handbook is in place, it is important that your company follows the policies in it and updates the handbook so that it is current with the inevitable developments in the law. While a handbook may take up time and resources that you would rather allocate elsewhere, its payoff is huge when faced with a lawsuit. Having clear and lawful meal and rest break policies can greatly assist in the event of litigation, as the lack of such policies can make it much more difficult to defend an employment lawsuit. Overall, making the effort to develop an employee handbook can go far to showing that you are trying to comply with the law.